The Thanksgiving Offering benefits the Colleges, Universities, Seminaries, and Divinity Houses affiliated with the Christian Church (Disciples of Christ). These learning communities are an extension of the church, challenging students to understand and respond to God’s call to serve. From the very beginnings of the movement, Disciples have founded institutions of higher learning, encouraging students in their intellectual pursuits. The Christian Church (Disciples of Christ) is still committed to higher education. Your gift to the Thanksgiving Offering helps underwrite the education of students attending one of our fourteen undergraduate institutions and our seven seminaries or divinity houses. Thousands of students have attended the Colleges and Universities of the Christian Church receiving both a quality education and the opportunity to remain within our Disciple’s heritage. Your financial gift provides scholarships and support for spiritual life offices. By giving to the Thanksgiving Offering you are investing in our students and helping keep education costs down. The Thanksgiving Offering also provides scholarship and support for those pursuing theological education at one of our seven seminaries or divinity houses. Consider the many generations of pastors, who, if not for the support of faithful congregations and individuals over the ages would not have flourished as our pastors, teachers and leaders. What impact has your pastor had in the life of your church, community or region? You can thank them by supporting the Thanksgiving Offering. 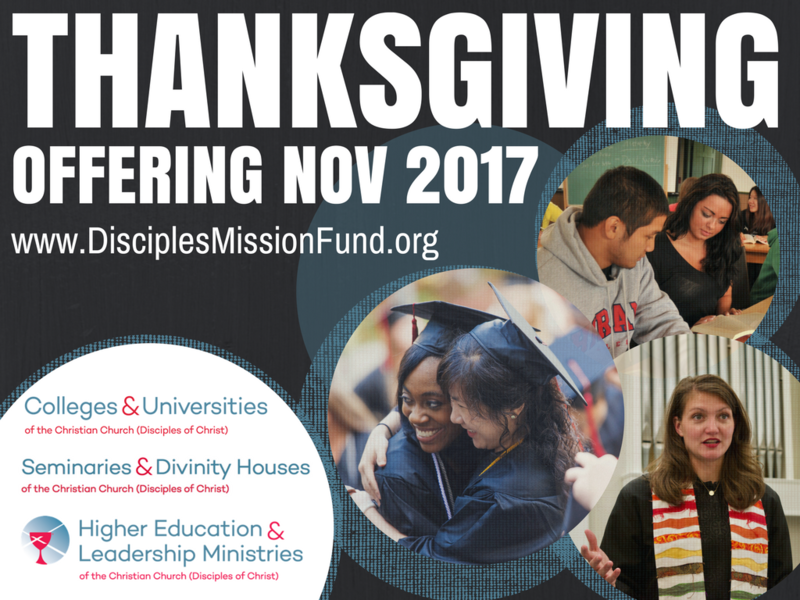 Attending a Disciples College or Theological School is possible through the scholarships and grants that are made available by generous individuals, the Disciples Mission Fund and your gifts to the Thanksgiving Offering.